It also receives the GT-R Nismo's engine, which gets new turbos borrowed from the latest GT3 series GT-R race auto. Powering the auto is the same 572PS/633Nm 3.8-litre twin-turbo V6 from the 2017 GT-R. That means it's still spitting out 600 horsepower and 481 pound-feet of torque to all four wheels, but the updates for 2020 further leverage that grunt. Nissan says the contact patch has been boosted by 11 percent. It also gets a new brake booster to improve stopping power. Nissan's also put the top GT-R on a bit of a diet. Compared to the 2019 GT-R NISMO, the 2020 version is lighter by 44 pounds thanks to the carbon-fiber diet and other lightweight components. It goes on sale later this month, though pricing hasn't been announced. With the GT-R, Nissan set out in pursuit of the ultimate driving pleasure. To celebrate the five-decade milestone for the ride, Nissan is offering up the 2020 370Z 50th Anniversary Edition that has interesting livery and touches for the commemorative model. Like the 50th Anniversary Edition Nissan 370Z that was also unveiled in NY, the commemorative GT-R amounts to an appearance package, with color schemes inspired by Japan's GP racing series. The special-edition model will be offered in three "heritage-era", two-tone exterior colour combinations representing the GT-R's liveries from the Japan GP series: Bayside Blue (with white racing stripes), Pearl White (with red stripes) and Super Silver (with white stripes). Fans of the R34-generation Skyline GT-R will be thrilled about the return of Bayside (Wangan) Blue, which on this anniversary special also adds white stripes. 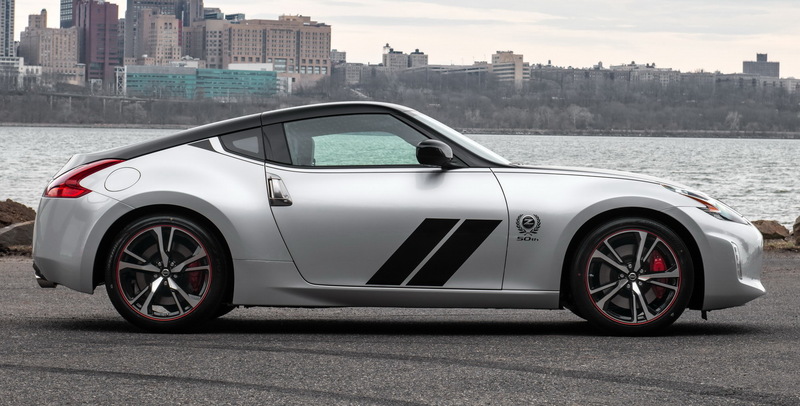 The red on white or black on silver livery is meant to celebrate the same racing livery that appeared on the original Datsun 240Z that came to the United States 50 years ago. Inside, Nissan has graced the birthday 370Z coupe with a range of red appointments - these include an Alcantara steering wheel with a red centre mark, 4-way power-adjustable leather bucket seats with red inserts and piping, red centre console stitching, red-accented tachometer, red gear shifter and 50th Anniversary-badged sill plates. Power is still sent to the rear wheels through the same range of six-speed manual and seven-speed automatic transmissions. The Track Edition gets an optional carbon fiber roof and Brembo carbon ceramic rotors and calipers - 16.1 inch rotors in front, 15.3 in back.